Welcome to another installment of our weekly Movie Gallery Giveaways! The winner from last week’s fun Scream Giveaway has been selected, and the Ghost Face Headknocker and 7″ action figure are packed and ready to go. This week we’re giving away two incredible 7″ action figures from the second installment of Quentin Tarantino’s brilliant Kunf-Fu epic, Kill Bill! In this film we return to the side of the Bride, a former world class assassin who seeks revenge against Bill- her former employer, lover, and father of her own daughter – who the Bride believes was lost in the assassination attempt on her own life that left her in a coma for years. As the Bride carves her way through the gang of former associates we learn of her own training, specifically at the hands of Pai Mei, a thousand year old Kung Fu master. Keep reading to see you can win! Pai Mei, whose name means “white eyebrow.” A martial artists who trained Bill, Elle, and the Bride. According to legend, Pai Mei was head priest of the White Lotus Clain and was over 1000 years old. He is the only known master of the legendary “Five-Point Palm Exploding Heart Technique.” These 7″ action figures from Quentin Tarantino’s bloody epic Kill Bill feature plenty of articulation and bases that can be joined with other figures in the series for some deadly duels! Pai Mei comes with cane, four swords, sword rack, and a display base. Ages 18+. Bill, the Snake Charmer. The leader of the Deadly Viper Assassination Squad is the former lover of the Bride and the father of her child. He’s also the man who sought revenge on the Bride for leaving him and massacred her entire wedding party, leaving the Bride for dead. 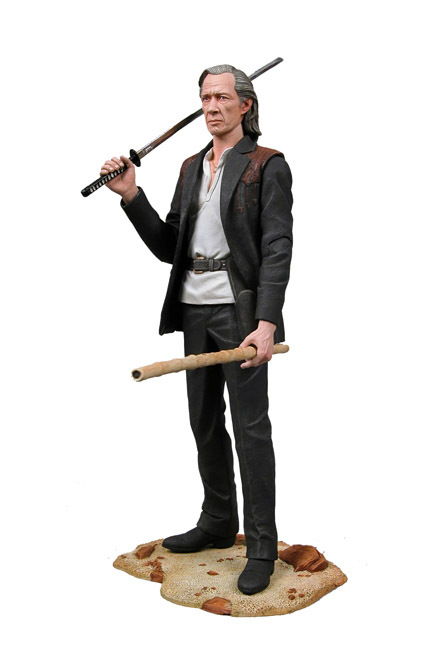 Bill comes with sword, sheath, pistol, flute, and a display base. 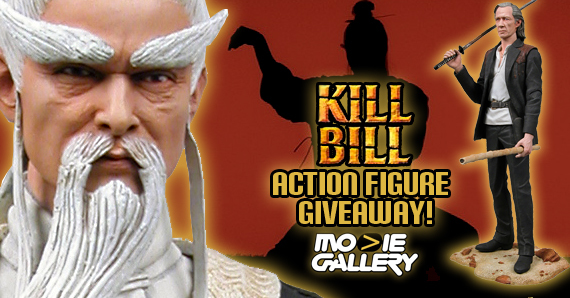 This entry was posted in Contests & Giveaways and tagged action figures, Bill, Bill Bill action figures, Kill Bill, Pai Mei by mgadmin. Bookmark the permalink.